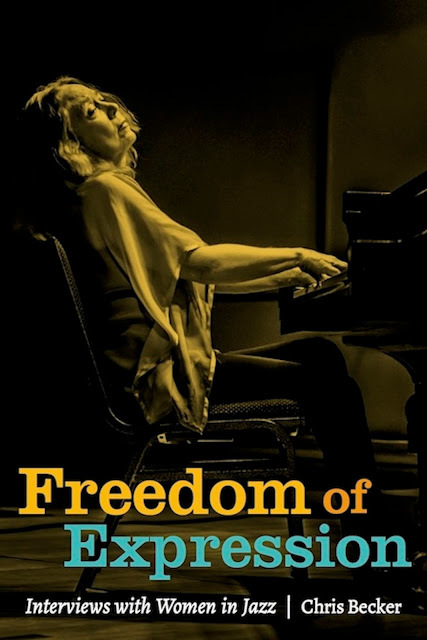 Educators can now purchase one or several copies of Freedom of Expression: Interviews With Women in Jazz for $16.50 (25% off the $22.00 cover price) plus shipping and handling. Published in November 2015, Freedom of Expression: Interviews With Women in Jazz is a timely collection of inspiring and in-depth interviews with 37 women musicians of all ages, nationalities, and races, who represent nearly every style of jazz one can imagine. The interviewees include Carmen Lundy, Terri Lyne Carrington, Eliane Elias, Helen Sung, Anat Cohen, Diane Schuur, Sherrie Maricle, Sharel Cassity, Jane Monheit, Ellen Seeling, Cheryl Bentyne, Brandee Younger, Jane Ira Bloom, and many other incredible artists. The 320-page book includes a 25-page history of jazz, as well as introductions to each interview, to provide helpful context for readers who are unaware of the contributions by women to the development of jazz. 1.) Contact Chris Becker at beckeresque@gmail.com with the name of your institution and total number of books you’d like to order. 2.) We will then email you an order form to complete which will include the total cost of your order. Once you return the order form, we will place your order. Educators can pay with a check or by using PayPal. We also accept purchase order numbers and will invoice you accordingly. Freedom of Expression: Interviews With Women in Jazz is now available for purchase from Amazon. Freedom of Expression: Interviews With Women in Jazz is a book collection of interviews conducted by writer and composer Chris Becker with 37 female musicians of all ages, nationalities, and races and representing nearly every style of jazz one can imagine. The interviewees include Eliane Elias, Terri Lyne Carrington, Anat Cohen, Helen Sung, Diane Schuur, Dee Dee Bridgewater, Cheryl Bentyne, Mindi Abair, Connie Crothers, and many other incredible musicians. Ah, New York . . .
April 30 is Independent Bookstore Day!